I like sherry. There, I’ve said it. Call me middle aged if you like, but I don’t care, sherry, like a nice bow tie, is cool. Palo Cortado takes sherry to a whole new level of lovely. Theoretically it’s only made by accident, when the layer of flor on a fino sherry dies off unexpectedly, exposing the wine to the air, which oxidises it and sends it nutty. Yes folks, your delicious fino and Manzanilla sherries are made extra delicious by a lovely blanket layer of fungus keeping them cool, and the death of that fungus and its slow, dead, descent through the sherry makes Palo Cortado delightful. 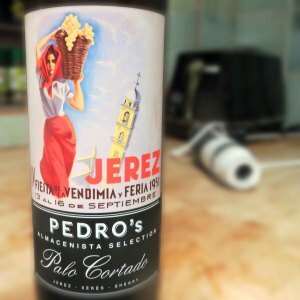 With modern winemaking techniques such disasters don’t happen very often, and because Palo Cortado is just so darned tasty that there’s a demand for it, sometimes flor meets with an accident, and goes to sleep with the fishes. Yeast murder out of the way, we get our wines, so everybody keep quiet, look the other way, you ain’t seen nothin’. So whether this flor died a natural death or met a terrible end at the hands of Pedro we’ll never know (ever, OK?). Either way it’s a beautiful golden amber colour, and it could just be my delight at picking up a glass, but it almost seems to glint as though it had sparkles of sunlight in it. I did tell you I liked Palo Cortado. It smells of Christmas, not overcooked turkey and Brussels sprouts Christmas, but nutty, fruity tasty Christmas. Think Christmas cake without any fripperies like cherries or abominations like candied peel, just oxidisation, nuts and sweet raisins with a little bit of sweet spice. It’s dry, very dry, so all that tastiness doesn’t cloy with sugar, it’s just heavenly. I may just have another glass and write some Christmas cards. Though I will have to log on to Majestic and order more for actual Christmas drinking. I like candied peel, i also Like Sherry. Candied peel is the Devil’s toenails.